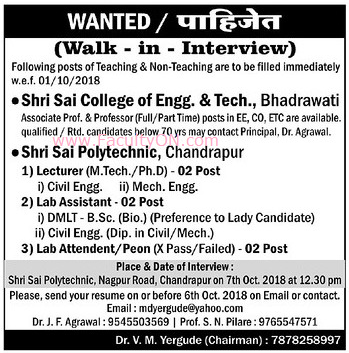 Shri Sai Polytechnic, Chandrapur has advertised in the LOKMAT newspaper for the recruitment of Lecturers Plus Non-Faculty jobs vacancies. Interested and eligible job aspirants are requested to apply on or before 06th October 2018 and then walk-in on 07th October 2018. Check out further more details below. About College: SHRI SAI POLYTECHNIC (SSPC) was established in 1994-95 by the renowned Society/Trust in Vidharbha Region named Late M. D. Yergude Memorial, Shikshan Prasarak Mandal, Chandrapur (M.S.) The institute is recognized by the Director of Technical Education (D.T.E. ), Mumbai and A.I.C.T.E., New Delhi. It is affiliated to Maharashtra State Board of Technical Education (MSBTE), Mumbai. How to Apply: Interested and eligible candidates are requested to attend the Walk-in interview by bringing updated CV along with originals & copies of certificates of education qualification / experience, PAN card, Aadhaar card and recent PP size photos to the following walk-in address. Before send your applications to the email address on or before 06th October 2018 or contact through phone.